Strategic Mapping is a process to gauge the competition and relative position of an organization. The concept, strategic group, used in strategic management, groups organizations within an industry that have similar set of strategies or similar business models. What services are offered by them? Which beneficiary group are they working with? What is their probable impact? What are their future plans? How the relationship with them lets you provide better services? After picking the top two factors as applicable, draw up a matrix showing each factor as shown in the following example. 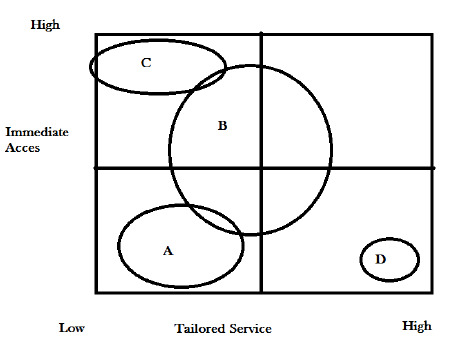 The diagram shows a rectangle with four quadrants having 'Immediate access' on the y-axis and 'Tailored service' on the x-axis. Drawn in the appropriate position on the grid (with regard to these two factors) are the four other players. The size of the circle that represents each corresponds to their size in the marketplace. Place all the other players in your organization’s strategic mapping group on this matrix. Draw a circle for each that offers idea about their relative sizes. Draw a circle for your organization there too. Are there any gaps? Are there any overlaps? Are there any options for change?